I'm not a doctor, I'm not a psychologist, I'm not an occupational therapist (OT). I'm a teacher, which brings with it a perspective that makes largely moot some of what those other professionals struggle with. For instance, I don't care so much whether or not "sensory processing disorder" (SPD) or ADHD or autism are included in the Diagnostic and Statistical Manual, which is the book to which these folks turn when forming a diagnosis. For instance, there is currently a debate within the overlapping worlds of various clinicians about whether or not SPD ought to be a stand-alone diagnosis or if the symptoms are simply a sign of some other underlying, officially diagnosable, disorder. It's interesting, I suppose, to read about, but it's not particularly helpful to me as a teacher in a preschool classroom, a place in which every child exhibits odd, quirky, and even outright bizarre behavior at one time or another. What I do care about is when I have a child in my care who is behaving in ways that are hurtful to himself or others. Several years ago, we had a boy in our summer program who had already been identified as "gifted." Within the the first 5 minutes of playing with him, I thought, and he's on the autism spectrum. When he was later diagnosed with Aspergers, I told his mom, "I thought so." She asked in disbelief, "Why didn't you tell me?" I replied by saying that it was just a gut thing, that after such limited exposure I couldn't have possibly known, that I'm not qualified to make a diagnosis, and, that I wasn't about to bring up such emotionally charged words as "autism" willy nilly. But the main part of my answer was, "It didn't matter." He was fully engaged and not hurting anyone. You see, being "disruptive" isn't really much of an issue at Woodland Park. We sometimes have to help kids practice keeping their voices down during the indoor portions of our day, and we do have our circle times which can be disrupted by a loud or unruly kid, but since we're a cooperative there is never a lack of laps on which these kids can sit, which, in almost every case, is the best way to sooth a child, and is never a bad thing no matter what the underlying cause. The rest of our days are designed around the children creating their own learning, moving how they choose, where they choose, when they choose, engaging for as long or as short as they want. Kids can go deep, they can go broad; they can do it loudly or softly; they can do it alone or in a big group. The only time behavior is an issue is when it comes to hurting or frightening themselves or others. Last year, we had a boy in class who had been previously working with an OT on what was being called SPD. One of the ways in which it manifested was that he had the impulse to roughly and frequently engage his classmates, often by biting, tackling, pinching, twisting their fingers or otherwise hurting them. Making matters worse, he was physically bigger than most of his classmates. He had already become quite adept at saying, "I'm sorry," although it seemed that it was without meaning to him, almost as if he were saying it as a social nicety like "please," "thank you," or "you're welcome." It seemed to me like what we were witnessing were misguided attempts at friendship, at connection, especially since the kids to whom he seemed most attracted where most often the "victims." Of course, it wasn't long before his classmates began to notice his patterns, sometimes talking of him as a "bad kid." I remember one such discussion around our snack table in which a group of four boys argued about whether or not he hurt other people on purpose: "He hurts me!" "Well, he never hurts me!" that kind of thing. The most distressing point came one day when we were playing with a tent outdoors. 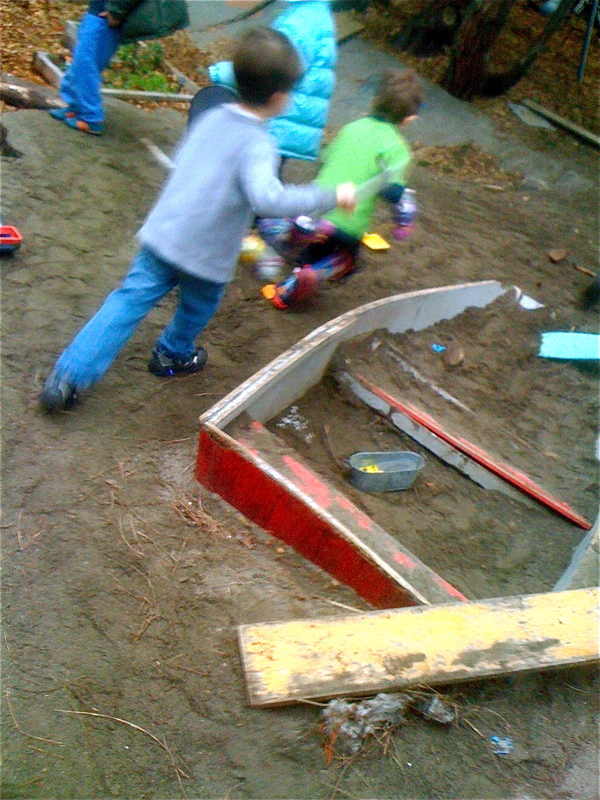 A large group of kids had declared it their fort and were making forays into the wider space to "hunt." At one point, the adults were shocked to realize that they were hunting this poor boy. Thankfully, he was oblivious, thinking he was just part of a fun running game: in fact, I'm pretty sure he thought he was the leader because everywhere he went, the other kids were running after him. We weren't going to stay so lucky forever. The adults in our community, prompted both by conversations they'd had at home with their own children, and by what they had seen with their own eyes, were understandably concerned, both about everyone's physical safety, but also about the stigmatization of this boy, who clearly wasn't fully capable of controlling his behavior. There were several meetings at which this was discussed. His parents shared extensively and honestly about what they knew and didn't know, offering tips and techniques that they had found effective. One of my points of confidence/arrogance, is that I'm convinced that given enough time and space, I can get any kid on my bandwagon, and this boy, while a unique challenge, was no different. That was not my concern. I was also not concerned about the parents of this boy, who were as engaged, involved and pro-active as any family I've ever known. I was more worried about the rest of our community: both kids and adults. What happened next, I think, was one of the most powerful things I've ever seen happen in our school. The parents, as a unified body, with the help of our parent educator, rose up to embrace this boy. There was no talk of removing him or drugging him or any of the other "solutions" that come up in other institutional settings. Instead, parents had conversations at home with their kids, helping them strategize ways that they could constructively stand up for themselves; how this boy sometimes didn't understand that he was hurting people, that we couldn't assume he knew what we were feeling unless we told him. Many families organized playdates outside of school, one-on-one opportunities to create different kinds of bonds than those forged in school. We came up with a community plan of action, one to which we all signed on, and implemented on a day-to-day basis in school. And you know what? Things started getting better. Yes, he still sometimes hurt his friends, but instead of squealing or crying as they had before, his classmates started saying, forcefully, "Hey, I don't like that! You're hurting me!" When he then said, "I'm sorry," it no longer sounded like an attempt to easily erase a mistake, but rather as if he really felt it. One day he asked, "Can I sit here?" and his classmate answered, "Sure, if you don't hurt me," to which he replied quite happily, "I won't!" and he didn't. After missing several days of class due to illness, he found himself in the center of a spontaneous group hug upon his return, something that simply could not have happened earlier in the year, both because the other kids were afraid of him and because it would have likely over-stimulated him. I won't exaggerate: there were several tense months in there, and lots of ebb and flow. He would still get wound up at times, but most of the kids either figured out to just steer clear or, amazingly, join him, jumping or "banging" or shouting along with him. He continued to have "bad days," but we were no longer over-reacting, making things worse, calmly dealing with the situation, and slowly those days became fewer until they really were rather rare. The OTs and others who were working with his family would occasionally attend class to observe him: they rarely saw much to concern them. Teachers, schools, children, and families don't have the time to wait for the clinical community to decide whether or not something can be diagnosed, an aspect of which being that there is some sort of treatment protocol. This boy's family provided us with reading material they had found useful, and I did quite a bit of reading on my own, much of which to little avail, other than to make me feel that helping him was beyond our little cooperative school's capabilities. I finally, settled on a metaphor that worked for me: it was like he was a helium filled balloon that sometimes became untethered and felt as if he were floating away, a sensation that must feel both exhilarating and frightening. Our job was to help anchor him back to earth and to understand that there was a part of him that didn't want to be brought back down. As emotionally hard as it was at times, looking back I realize that this was our school's real project for the year. I am so grateful that we are a cooperative, that we are a true community of families, that it didn't matter what his diagnosis, or even if there was a diagnosis, but rather that we found our course of treatment. We acted like a community. It was as simple and as challenging as all that.